Buenos Aires, the capital of Argentina, is set on the banks of the Rio de la Plata. The rhythm and passion of the city stems from its European and Latin American roots. Its 47 "barrios" (neighborhoods) trace the history of the city, each with its unique character, pulse and spirit. Within each official barrio there are others. Long wide avenues cut through the barrios each with its own story and place in the growth of the city. Old world charm blends with the new contemporary lifestyle. We found the diversity intriguing and addictive. Whether you spend days, weeks or months there, go to as many neighborhoods as possible and you, too, will fall in love with Buenos Aires. 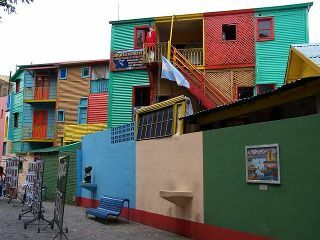 Barrio La Boca was the city's original port where new immigrants arrived, many from Italy. It was a thriving neighborhood until the cholera epidemic hit in the 1880s. The wealthy left, leaving the portside area to the poor working class. La Boca has never recovered but does sport two main attractions: Museo de Bellas Artes al Aire Libre Caminito (outdoor museum of fine arts on Caminito) a 100 meters long, curved street, created by resident Arturo Carrega and artist Benito Quinquela Martin, lined with corrugated tin houses painted in bright colors. The street was named Caminito in homage to a popular tango song. The area around is packed with tacky tourist shops, seedy cantinas, and old tenement buildings. La Boca is home to one of the most famous football teams in Argentina, The Boca Juniors, who play in the 60,000 seat stadium, La Bombonera, which is painted bright blue and yellow (team colors). The Museo de la Pasion Boquense is located adjacent to the stadium entrance on Brandeson. Football enthusiasts will find all they ever wanted to know about the sport in the country and can choose from a huge assortment of blue and yellow souvenirs. It is reported that the club is a marketing machine with over 1000 blue and yellow items available. Since the rabid fans consider themselves "cradle to grave" devotees (the team being more important than anything else in life), the team developed a cemetery for everyone professionally connected, which offers fans the opportunity to be buried with their heroes for thousands of pesos. The Barrio Barracas is just west of La Boca and it too is still a rough and tumble old neighborhood but unlike La Boca is considered to be a candidate for renewal, which has already started on Calle Lanin, a long winding street of neat stucco homes and buildings that have been painted in creative patterns in soft tones, in pleasant contrast to the tin and brightness of Caminito. North of and adjacent to La Boca is San Telmo, which suffered a yellow fever epidemic and exodus but managed to retain the glory of its past and build upon it. The worn colonial mansions, many of which have been refurbished into shops, tango houses, museums and restaurants, join the cobbled stone streets to create an old world charm that makes San Telmo a favorite with tourists. It is said that tango originated here, but the folks in La Boca might disagree. While tango is alive in all neighborhoods it has a very strong presence here in San Telmo with many venues dedicated to learning or enjoying the dance. Plaza Dorrego, the second largest plaza in Buenos Aires, hosts a famous antique fair on Sundays which spreads the length of Calle Defensa (the main shopping street in San Telmo) complete with tango dancers, musicians, artists and mimes who perform all along the route. The Pasaje la Defensa, Defensa 1179 is an example of a traditional 1880s mansion with two stories and a terrace that neatly houses antique, art and souvenir shops. The Mercado de San Telmo is a striking building with an Italian designed facade, constructed of iron and a roof of metal sheets and glass. The food shops inside were tempting and since we were there on a Sunday, every inch of space was filled with antique vendors. Plaza de Mayo stands between San Telmo and San Nicolas. Plaza de Mayo is the true heart of Buenos Aires. Since 1810 the passionate soul of Argentina is acted out on this stage. 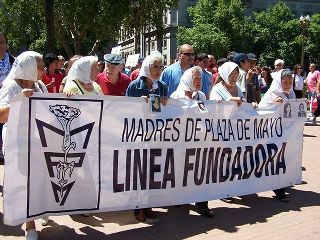 We came on a Thursday afternoon to witness one of these events, The Madres de Plaza de Mayo gather to protest the "disappearance" of their loved ones during the military dictatorship of the 1970s and early 1980s. We watched as the surviving women donned white and blue head scarves inscribed with the words "reason" and "place". After embracing each other, friends and compassionate onlookers they linked arms and marched round and round the Piramide de Mayo, an obelisk raised in 1811 in the center of the plaza to mark the anniversary of the May revolution. The Casa Rosada (pink house) at the east end of the plaza is home to the executive powers of the country. The color glows as the setting sun emblazons its asymmetrical and eclectic facade. At the western side is El Cabildo (city hall). It was here on May 25, 1810 that the first Government Assembly was proclaimed. It is a modern version of its original colonial style, quite lovely. The Catedral Metropolitana (Metropolitan Cathedral) is home to the Archbishop of Buenos Aires. It's a handsome building with neo-classical facade and baroque interior. Avenida de Mayo joins Plaza de Mayo and the squares of two congresses (venues of the executive and legislative branches of government). The wide avenue was inaugurated in 1894 and designed as a Parisian boulevard. Lined with plane trees, it is home to many exquisite European style buildings. No walk along Av. Mayo is complete without a stop at Cafe Tortoni, the oldest coffee shop in Buenos Aires. Sitting at the oak and green marble tables in the Parisian environment, it is easy to see why this has been the gathering place for Buenos Aires intellectuals, tangueros and politicians. The Plaza de los Dos Congresos is home to the Monumento a los Dos Congresos, which commemorates the first constitutional assembly in 1813 and the declaration of independence in 1816. The plaza also contains the Palacio del Congreso, a grand building reminiscent of the Rome's monument to Vittorio Emmanuele. San Nicolas is the financial district of the country and the commercial center of Buenos Aires. "Porteños" rushing to and from their offices and tourists out shopping pack the old narrow streets and sidewalks, competing for space with fellow workers, shoppers and aggressive drivers. It's a zoo, but it's real and fun. In the late 19th century the city began moving north along Calle Florida, 10 blocks long, between Plaza de Mayo and Plaza San Martin. In 1971 Florida was designated as a pedestrian way for day and night (previously it was by day only). This once-elegant street is now home to the shopping hordes complete with visual pollution, hawkers, an army of people handing out coupons for a nearby shop or restaurant, mimes, tango dancers, money changers and beggars. There are about 20 shopping galleries and a huge array of shops. In the middle of it all is the Galerias Pacifico shopping center, which you must visit. Milans Vittorio Emmanuele Gallery inspired the design of the original building. The renovation to a shopping complex brilliantly retained the beauty of the original work. Of particular note are the murals in the central gallery painted by five of Argentina's masters. Avenue Corrientes starts in San Nicolas and runs about 60 blocks cutting through neighborhoods changing faces along its westerly route. Its Buenos Aires' Broadway. The theatres are getting old but there are signs of renovation and renewal. Classic cafes and bookshops cater to avid literature lovers. Famous pizzerias compete to be named the city's best. You've got to love this avenue, as do the "porteños". Corrientes never sleeps, day and night (especially on week-ends) thousands of people and vehicles crisscross the wide street and sidewalks. A walk on this avenue is a voyage into the soul of everyday life in the city. Where Corrientes crosses Av. 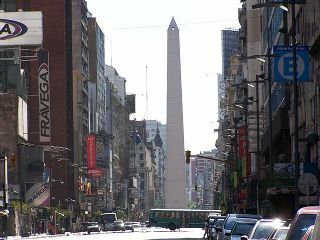 9 de Julio (the widest boulevard in the world) at Plaza de la Republica is the Obelisco (obelisk), one of the architectural symbols of the city. It's the gathering place for sport celebrations and political demonstrations. Getting back to 9 Julio, I counted 21 lanes at one point divided by grassy islands and a series of traffic lights. It's impossible for a pedestrian to make the complete crossing in one pass. Use extreme caution, do not try to beat a signal, be patient and live. Abutting San Nicolas to the north is Retiro. Calle Florida leads directly into Plaza San Martin (Retiro's major attraction), named after Argentina's beloved liberator, Jose San Martin. In further tribute to the liberator is the Monumento al Libertador General San Martin, the city's most important monument. It was the first statue with an equestrian motif, quite fitting as the Regimento de Granaderos a Caballo were trained by San Martin in this exact location, home to country's first military barracks. It is the custom for famous foreign visitors to leave a floral offering at the base of statue. A gorgeous shaded green park sits high on a natural knoll dominating the center of the square, which is surrounded by impressive architecture. The Edificio Kavanagh was originally designed for inland ranchers to rent with fine details and hotel services. It opened in 1936 standing 360 feet high with 33 floors, at the time the highest concrete structure in South America. It's an art deco beauty. Next-door is Basilica del Santisimo Sacramento, opened in 1916. Mrs. Mercedes Castellanos de Anchorena who lies buried within commissioned it. It's the most luxurious temple in South America for an individual using private funds. Jose Paz, founder of La Prensa newspaper, built the city's largest most lavish mansion and never lived there. Its 129,000 square feet was sold to federal government and it is now the Circulo Militar, a gathering place for retired Army officials and officers and an Arms Museum. The Palacio San Martin was built in 1909 for the Anchorena family. A stately building that appropriately now belongs to the State Department. Leaving the plaza and proceeding to the north end of Retiro along Calle Suipacha we came to Plaza Embajada de Israel at the corner of Calle Arroyo, where the Israeli Embassy stood until it was bombed March 18, 1992. The outline of a wall looks down at a park where a tree stands in remembrance of each of the victims of the fatal terrorist attack, one of Buenos Aires's harsh reminders of the threat that lurks around every corner. Just down the street at #1422 is the Museo de Arte Hispanoamericano Isaac Fernandez Blanco. The white neo-classical palace is a museum of 18th to 19th century Spanish and American furniture, pottery, costumes, jewelry, silver, engravings, sculptures, paintings, religious objects and a tiny room with a fabulous doll collection. British residents donated the Torre Monumental in Argentine Air Force Square to the Argentine Republic in 1916. The tower contains a history gallery, photography gallery and a watchtower. Across the way is the Estacion Retiro (Retiro railway station), which was opened in 1914. Its iron structure was manufactured in Liverpool from designs by a team of British engineers and architects. 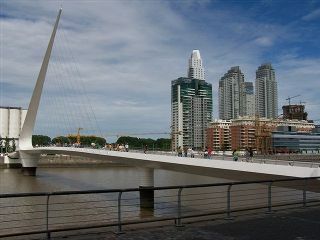 East of old Buenos Aires is the city's newest neighborhood, Puerto Madero and its extension Costanera Sur. This old port area was built in the 19th century and abandoned in the 20th. A transformation began in the 1990s and continues in high gear. The contrast is vivid. Steps from the historic Plaza de Mayo restaurants and cafes with outdoor patios, apartment and office buildings line the rejuvenated dockside. An eye-catching bridge, Puente de la Mujer (woman's bridge), designed by a Spanish Architect and manufactured in Spain gracefully links the west and east promenades. The old cranes used to move cargo have been colorfully restored and cleverly employed as an attractive design element that joins the past to the present. The new high-rise buildings offer splendid views of the river and the city. Promenades on both sides have become a favorite venue for walkers, runners and bikers. The air is fresh and bathed in sun. There are boats, banks, ATMs, movie theatres, a university campus, 5 star hotels and plenty of parking. If you can afford it and are willing to share your space with zillions of visitors the quality of life is luxurious. Just to the east a long wide esplanade separates Puerto Madero and Costanera Sur, a National Ecological Reserve. Its 350 hectares of local fauna, flora, alder trees and willow forests are laced with 5 miles of clearly marked trails. Buenos Aires' youngest barrio is creating a new lifestyle for "porteños" and a destination for visitors. When the wealthy moved from the center during the cholera and yellow fever epidemics, they settled in the neighboring barrio, Recoleta, and its sub-barrio, Barrio Norte, our neighborhood for two months. We loved wandering the elegant streets and avenues shaded by a canopy of green courtesy of the multitude of gorgeous trees along the sidewalks. Speaking of sidewalks - throughout the city the roots of the old large trees are constantly breaking through and dislodging the stones of the walks, be careful. Also you will see that the design and material of the sidewalks is very varied. This is because property owners are responsible for their section of the sidewalk - no central planning here. All of our daily shopping and service needs were minutes away. Our apartment was well located for easy walking to nearby barrios or if we were going further, we hopped on a bus. When we arrived home after a day of touring we would join the locals at Cafe Josephine at the corner of Juncal and Guido for late afternoon to early evening coffee and a sweet or head to our favorite Un Altra Volta helado (ice cream) shop at the corner of Av. Callao and Pacheco de Melo (helado will be discussed in greater detail when we report on food). This local routine is necessary because one should not suffer until the late dining hour. Recoleta is renowned for its European architecture, green plazas, foreign embassies, five star hotels, upscale restaurants and shops. It is probably best known for its cemetery where visitors flock to see the final resting place of Maria Eva Duarte de Peron, known as Evita. 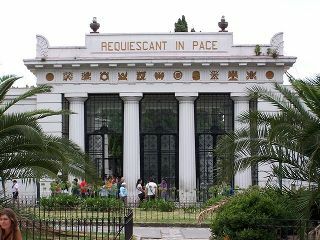 We did the requisite visit through the rows of granite, marble and bronze mausoleums. It was hilarious watching everyone following everyone else, hoping theyd be lead to Evitas tomb. Adjacent to the cemetery is the Basilica Nuestra Senora del Pilar that was consecrated in 1732. We found interesting views of the cemetery from the small museum next to the church. Just north of the church is the Centro Cultural Recoleta, which has exhibition facilities devoted to contemporary visual arts, concerts, theater, dance, music and video. 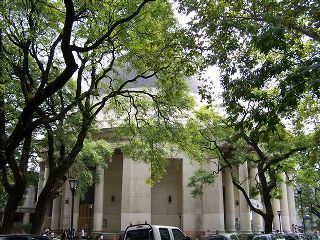 In front of the cultural center and cemetery is the grassy Plaza Francia and adjoining Plaza Alvear, a popular spot where family and friends relax together. On weekends these plazas are taken over by a popular handicraft fair (there are many such fairs throughout the city on week-ends). The stalls are neatly arranged along the paths and the merchandise is well presented. In general the quality of the crafts is excellent and well priced. In front of the park at the corner of the elegant Av. Quintana and the pedestrian way Roberto Ortiz is one of Buenos Aires most famous coffee shops, La Biela. From its outdoor tables you can catch all the action including nearby tango dancers and 200-year-old imposing rubber trees ("gomeros" and "ombu") also embracing the tango beat (bet you didn't know trees could dance). Junin and Vicente Lopez border the cemetery area. Junin is lined with pricey restaurants with "greeters" out front vying for your business. The Village on V. Lopez is a modern complex with restaurants and a large cinema. Tourists abound in this part of Recoleta. For luxury lodging and shopping visitors head for Av. Alvear and Calle Posadas. If youre not into that price range, it is still worth a visit to see the splendid buildings that house the hotels and shops. If you're an art lover, Recoleta's Museo Nacional del Bellas Artes, Avenida del Libertador, 1473 is a must visit. There are 32 rooms displaying permanent and visiting exhibitions. The layout and presentation makes viewing easy and enjoyable. Works by Rembrandt, Goya, Van Gogh, Picasso, Kandinsky, El Greco, Rodin and contemporary Argentinean artists provide an outstanding and diversified collection for all tastes. Across the way in the Plaza Naciones Unidas is the huge silver sculpture of a rose, whose petals open at sunrise and close at sunset. Museo Nacional de Arte Decorativo, Avenida del Libertador, 1902, will appeal to the designer in you. A French architect designed and built this mansion in 1911. It became a museum in 1937. A marvelous collection of decorative art is displayed in the majestic rooms and hallways. Recoleta runs seamlessly into the Barrio of Palermo, which itself is comprised of three distinct sub-divisions, one of which is further divided into two. Palermo Chico rich in embassies and luxurious dwellings bridges Recoleta and the awesome greenery of Palermo. Palermo Viejo is comprised of Palermo Soho and Palermo Hollywood. Palermo Chico is bordered by the wide Av. Pte. Figueroa Alcorta and the railway line running from the nearby Retiro train station. It was amazing and shocking to find this opulence next to train tracks. Buenos Aires newest museum, Museo de Arte Latinoamericano de Buenos Aires or MALBA is located at Figueroa Alcorta 3415. The design is smashing, bathed in white with glass panels along the escalators, a delicious setting for the modern colorful paintings of international and Argentinean masters. Outside terraces display attractive metal sculptures. There is a cafe and terrace restaurant. Abutting Chico are the parks, plazas, lakes, gardens, zoo, hippodrome, polo grounds, planetarium and municipal golf course of Palermo, an amazing, green expanse for relaxation and entertainment right in the city. Plaza Italia at Av. Santa Fe is the main transportation hub (subway line D and buses) to reach this area. 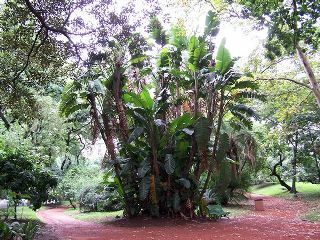 Exit the subway, jump off the bus and find the Jardin Botanico (botanical gardens) and its neighbor the Jardin Zoologico (zoo). 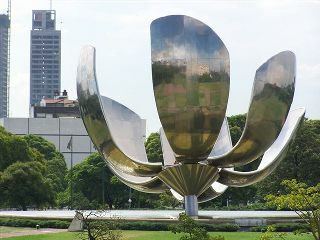 Nearby is the Jardin Japones, donated by the Japanese community of Buenos Aires. All pathways pass through Parque 3 de Febrero, the favorite spot for locals and tourists to sunbathe, row or peddle a boat in the nearby lake or just wander the paths at your own pace. In the middle of the park is the Rosedal (rose garden) with the Jardin de los Poetas (garden of the poets) at its center. It was created in 1914 and about 12,000 bushes have grown here. The palatial exterior of Hipodromo Argentino de Palermo is worth a look even if you are not a horseracing fan. Inside its sixty hectares are three cava sand tracks, the main one being 2400 meters long. There is seating for 100,000. For those with their eyes in the sky the Planetario Galileo Galilei (planetarium) with five floors, a circular room 20 meters in diameter and seating for 360 is an astronomical delight. All this can be worked in with taking in a polo match or playing a round of golf meters away. The wide, prestigious Avenida Del Libertador runs along the southern border. Here you will find handsome high-rise apartments overlooking the green and the river beyond. Palermo Viejo (old Palermo) is in stark contrast to its northern cousins, Palermo and Palermo Chico. It started in Palermo Soho (named after the district in New York City it emulated). It was pretty run down until about ten to fifteen years ago when young blood with small budgets and lots of creative talent moved in. They renovated the one and two storey homes and town houses others opened shops to sell their inspired fashions while some opened restaurants, cafes and bars. Word spread worldwide and young talent began to arrive bolstering the home grown, particularly in the areas of music, movie and television production. Old warehouses were converted to movie and television studios and Palermo Hollywood was born. Railway tracks and Av. Juan B. Justo divide Palermo Soho and Palermo Hollywood. Today Palermo Viejo not only represents the best of cutting edge fashion and dining in the city but also is gaining fame for its world-class television, film and music productions. 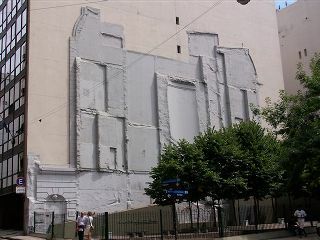 Palermo Soho is ahead in rejuvenation but it has been so successful Hollywood is benefiting from the spillover. The finest array of restaurants is now found in all of Viejo representing cuisines from around the world. Not to fear, there's plenty of steak and pizza to please the traditionalists. The Plaza Julio Cortazar is the heart of Soho. On weekends an arts and crafts fair extends into the surrounding streets and draws huge crowds. Small boutique hotels are springing up catering to the tourists who thrive in this environment. High-rise apartment buildings are being built on the Hollywood side to accommodate the demand for the lifestyle of Palermo Viejo. Las Canitas is a sub-barrio of Palermo, a triangle tucked between Palermos parks and neighboring Belgrano behind the Campo Argentino de Polo, and Campo Hipico Militar and bordered by Av.Luis Mario Campo and Av. del Libertador. The older buildings and homes are rapidly being renovated and high-rise apartment buildings are springing up. This is a precious enclave, especially attractive to the younger generation with its diversified restaurants, cafes, bars, clubs and outdoor patios lining the tree-lined streets of Baez, Arcos, and Solodado de la Independencia. Calle Migueletes is a pretty street of quality apartment buildings and shopping to match, while Calle Argibel has some of the city's best designer shops. Like Palermo Viejo, it's leading the way in building a new young spirit and culture in the core of the city. Neighboring Belgrano is a splendid middle to upscale residential barrio divided into three designations: Belgrano R (residential), Belgrano C (central) and Bajo Belgrano (lower Belgrano). Avenida Cabildo is the main transportation (subway line D and buses) and shopping street through the heart of the barrio. Belgrano R is home to the wealthy, embassies and consulates. Calle Conde is a quiet street of lovely homes, low-rise apartments and beautifully maintained grounds. Of particular note is the brick and stained wood design of the Ukranian Embassy with an intriguing roofline. Conde leads into Plaza Castelli, the center of "R", with a pretty park, cafes and restaurants. We stopped at the cafe Maru Botana for excellent coffee and cake where the kind owner recommended we visit Av. Melian a few blocks away. This glorious boulevard has a thick canopy formed by mature trees. The large homes are modern, contemporary and traditional in design with Latin American, North American and European influences. Each home is set in the middle of a garden, with thick grass, plantings and flowers. The second most important street is Juramento, which runs through the entire barrio. A few blocks past Cabildo is the heart of Belgrano C, Plaza Gral Manuel Belgrano, the man for whom the barrio was named. General Belgrano won three battles for independence and created the flag of Argentina. Iglesia de la Inmaculada dominates the square, because of its round design it is called La Redonda. The dome is 130 high rising over a rather solemn interior. The Monumento a Belgrano (a bust of the man) sits in the middle the park across from the church. There is always a crafts fair in and around the park - very busy on weekends. On the other side of the Plaza is the Museo Historico Sarmiento. The building was declared a National Historical Monument in 1938 because in 1880 it was the headquarters of the national government. It seems there was a dispute between the national government and the province of Buenos Aires in that year and Belgrano became the nations capital for a few weeks. It was originally built in 1869 and served as the town hall until 1874. The museum was inaugurated on Sept. 11, 1938 with a collection of objects that belonged to former President Domingo Faustino Sarmiento and a sector dedicated to former President Nicolas Avellaneda and the men of the 1880 Congress. Across the busy Juramento is the Museo de Arte Espanol Enrique Larreta, the former residence of this diplomat, writer and artist. There is a collection of furniture, ceramics and paintings. The main attraction is the Andalusian style garden where outdoor concerts are held in the summer. Further along is the lush Barrancas de Belgrano with a metallic surface square featuring tango dancing on Sundays, a small-scale replica of the Statue of Liberty and a lovely fountain. Nearby and centered on Av. Arribenos is Buenos Aires own Chinatown. There are several restaurants, which feature Taiwanese cooking, specialty food shops and a Buddhist temple. We did find other Chinese restaurants around the city, one of which we will discuss when we get to talking food. Luxury high-rise apartment buildings fit comfortably into the leafy streets of Belgrano C. There are excellent dining and shopping options nearby. It's a divine living environment. Bajo Belgrano is best known for its sporting and recreational activities including football clubs and tennis. Once (pronounced on-say) and Abasto are sub-barrios of Balvanera west of downtown. Once is a working class barrio, where "porteños" of various ethnic backgrounds go about their daily lives. Buenos Aires large Jewish population has a long history on these streets. New immigrants from other South American countries, Korea and the Middle East are moving in as the older residents depart. This is the center of commercial bedlam, narrow streets packed with wholesale and retail outlets. Shelves and counters are piled high with garments, rolls of fabric, home furnishings and house wares. Racks and cartons are schlepped (hauled) along the streets and sidewalks while Latin music blasts away. If you are a true bargain shopper or just plain revel in this scene this is the place to be. Once and its neighbor to the west Abasto are bordered by Av. Rivadavia to the south and Av. Cordoba to the north. The wide shopping Avenue Pueyrredon runs through the middle. Subway line "A" takes you to Once at the Plaza Miserere stop and line "B" to Abasto at the Carlos Gardel stop. Abasto is an old neighborhood that fell on hard times. It is a famous tango area where many musicians lived, the most famous of which and a "porteños" idol, the singer Carlos Gardel. The largest shopping center in Buenos Aires is located here at Corrientes 3247 (between Aguero and Anchorena). In 1930 Buenos Aires felt the need for a distribution center for its produce and in 1934 el Mercado de Abasto was opened. It was closed down in 1984 and sat idle for 15 years while the surrounding area became a haven for booze and drugs. The market was beautifully refurbished inside with additional structures at the back and side. Wisely the masterful art deco facade with its curves and arches was kept untouched. 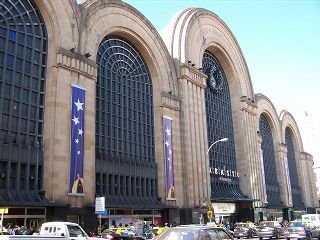 In 1999 the rebirth was complete and Abasto Shopping Center opened to the public. The ten blocks surrounding the center are being made over with a tango theme, which it is hoped will be a catalyst for a larger renewal.